Before the midterm elections dozens of drugmakers had already poured about $12 million into the war chests of hundreds of members of Congress. Since the beginning of last year, 34 lawmakers have each received more than $100,000 from pharmaceutical companies. Two of those each received more than $200,000. 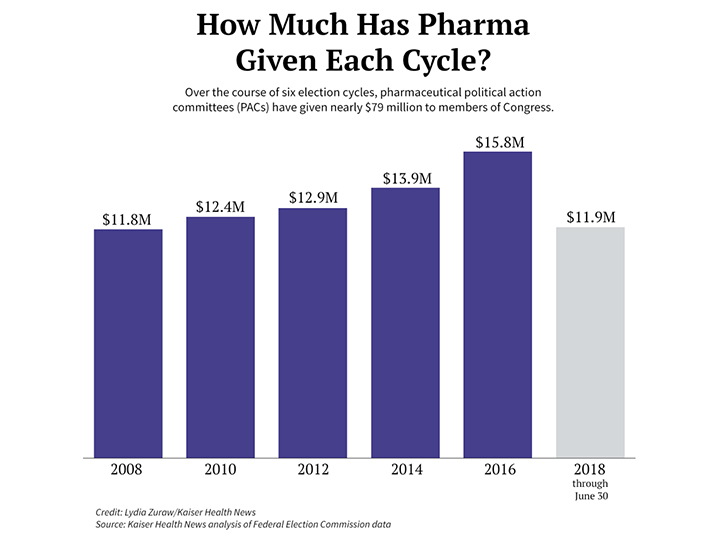 A new database, “Pharma Cash to Congress,"tracks up to 10 years of pharmaceutical company contributions to any or all members of Congress, illuminating drugmakers' efforts to influence legislation. The drug industry ranks among lawmakers' most generous patrons. In the past decade, Congress has received $79 million from 68 pharma political action committees, or PACs, run by employees of companies that make drugs. Drugmakers’ campaign contributions have reached record-breaking levels in recent years as skyrocketing drug prices have become a hot-button political issue. While PAC contributions to candidates are limited, a larger donation frequently accompanies individual contributions from the company's executives and other employees. It also sends a clear message to the recipient, campaign finance experts say, one they may remember when lobbyists come calling: There's more where that came from. The analysis shows that pharmaceutical companies tend to play the field, giving to a wide swath of lawmakers on both sides of the aisle. The drug industry favors power contributing frequently to the parties in power, giving more to lawmakers in leadership roles. Money also tends to flow to congressional committees with jurisdiction over pharmaceutical issues. This election cycle, 28% of lawmakers did not receive any contributions from pharmaceutical PACs. Under federal law, corporations cannot donate directly to political candidates. Exploiting a common loophole, they instead set up PACs, funded by money collected from employees. Those PACs then donate to campaigns, which are free to spend that money as they wish on necessities like advertising or campaign events. Campaign contributions tell only part of the story. Drugmakers also spend millions of dollars lobbying members of Congress directly and give to patient advocacy groups, which provide patients to testify on Capitol Hill and organize social media campaigns on drugmakers’ behalf. And like other industries, pharmaceutical companies wield their political power in ways veiled from the public, giving to "dark money" groupsand super PACs -- independent groups barred from directly donating to or coordinating with campaigns -- bent on swaying lawmaking. "Contributions help keep the door open for company lobbyists," he said.